The top label is the title label, I don't know how many lines it will be. I need the title label to display all lines of text. I also need the other two labels and the small image to be laid out right below the title, however tall it happens to be. I have set vertical spacing constraints between the labels and small image, as well as a top spacing constraint between the title label and its superview and a bottom spacing constraint between the small image and its superview. The white UIView has no height constraint, so it should stretch vertically to contain its subviews. I have set the number of lines for the title label to 0. How can I get the title label to resize to fit the number of lines required by the string? My understanding is that I can't use setFrame methods because I'm using Auto Layout. And I have to use Auto Layout because I need those other views to stay below the title label (hence the constraints). Use -setPreferredMaxLayoutWidth on the UILabel and autolayout should handle the rest. See the UILabel documentation on preferredMaxLayoutWidth. Only need to set the height constraint in storyboard to Greater than or equal to", no need to setPreferredMaxLayoutWidth. Expand your label set number of lines to 0 and also more importantly for auto layout set height to >= x. Auto layout will do the rest. You may also contain your other elements based on previous element to correctly position then. The intrinsic content size of UILabel and NSTextField is ambiguous for multi-line text. The height of the text depends on the width of the lines, which is yet to be determined when solving the constraints. In order to solve this problem, both classes have a new property called preferredMaxLayoutWidth, which specifies the maximum line width for calculating the intrinsic content size. Since we usually don’t know this value in advance, we need to take a two-step approach to get this right. First we let Auto Layout do its work, and then we use the resulting frame in the layout pass to update the preferred maximum width and trigger layout again. The first call to [super layoutSubviews] is necessary for the label to get its frame set, while the second call is necessary to update the layout after the change. If we omit the second call we get a NSInternalInconsistencyException error, because we’ve made changes in the layout pass which require updating the constraints, but we didn’t trigger layout again. In this case, we don’t need to call [super layoutSubviews] first, because when layoutSubviews gets called, we already have a frame on the label itself. To make this adjustment from the view controller level, we hook into viewDidLayoutSubviews. At this point the frames of the first Auto Layout pass are already set and we can use them to set the preferred maximum width. Lastly, make sure that you don’t have an explicit height constraint on the label that has a higher priority than the label’s content compression resistance priority. Otherwise it will trump the calculated height of the content. Make sure to check all the constraints that can affect label's height. I was just fighting with this exact scenario, but with quite a few more views that needed to resize and move down as necessary. It was driving me nuts, but I finally figured it out. 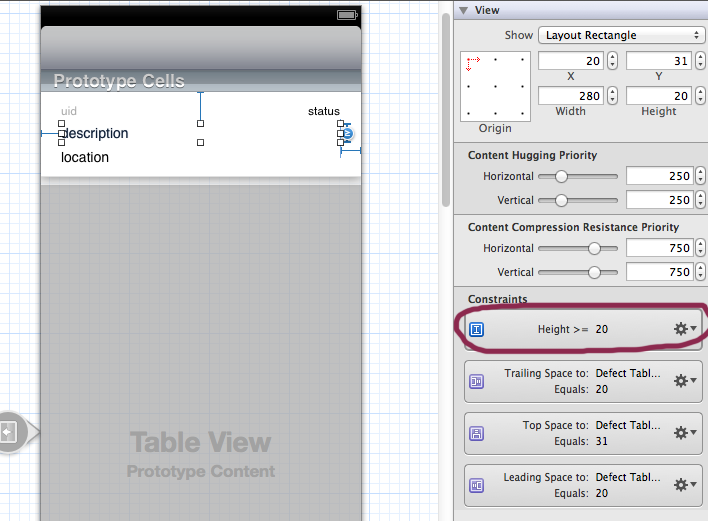 Here's the key: Interface Builder likes to throw in extra constraints as you add and move views and you may not notice. In my case, I had a view half way down that had an extra constraint that specified the size between it and its superview, basically pinning it to that point. That meant that nothing above it could resize larger because it would go against that constraint. 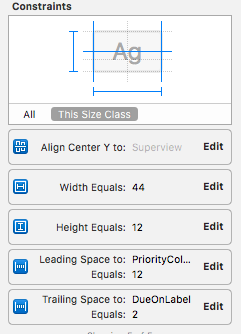 If the view is stuck, follow the views that are below it and make sure one of them doesn't have a top space to superview constraint. Then just make sure your number of lines option for the label is set to 0 and it should take care of the rest. Set content hugging priority, horizontal to low, so it'll fill the given space if the text is short. Set content compression resistance, horizontal to low, so it'll wrap instead of try to become wider. Set the number of lines to 0. Set the line break mode to word wrap. None of the different solutions found in the many topics on the subject worked perfectly for my case (x dynamic multiline labels in dynamic table view cells) . I have a UITableViewCell which has a text wrap label. I worked text wrapping as follows. 1) Set UILabel constraints as follows. 2) Set no. of lines to 0. 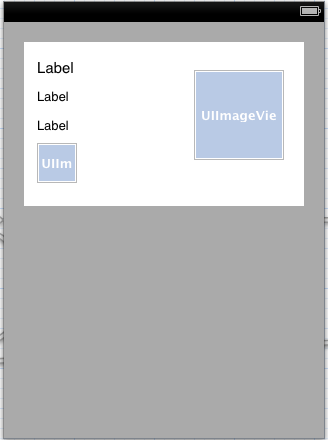 3) Added UILabel height constraint to UITableViewCell. @IBOutlet weak var priorityLabelWidth: NSLayoutConstraint! Not the answer you're looking for? Browse other questions tagged iphone ios cocoa-touch autolayout or ask your own question. How do I set the height of tableHeaderView (UITableView) with autolayout? Autolayout: Add constraint to superview and not Top Layout Guide?